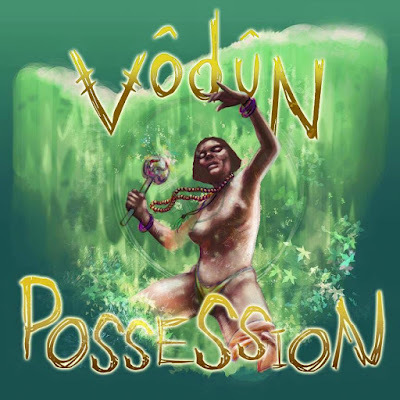 Possession is the debut record from Vodun, a heavy psychedelic rock soul three-piece from London. We tipped the band at the start of the year as one of our Future Sounds Of 2016 so we've been eagerly waiting for the release date to arrive. The group is composed of Oya (vocals), Marassa (guitars), and Ogoun (drums) and have been together for a couple of years. The album is the first full release from the London based Riff Rock Records. Possession has been mixed by Tom Dalgety (Royal Blood) and has already received high praise from the likes of Kerrang, and Classic Rock. The 11-track album comes in at 39 minutes and is available on CD as 6 panel digipak and on limited edition orange vinyl through Cargo Records. The album contains much variation, with the distinctive vocals from Oya being soulful and otherworldly, whilst Ogoun and Marassa lay down a loud and frenetic bedrock of drums and guitars. 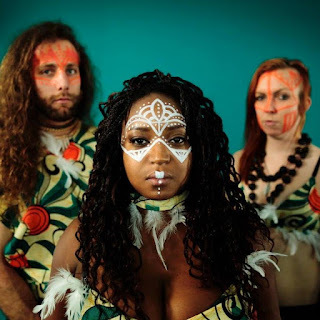 It's difficult to not get drawn into the 'world of Vodun' as the band put it themselves, with the fact they don't take things too seriously meaning you can easily lose yourself amongst the songs and alternative dimension that Possession takes you into. Vodun will be heading out on a UK tour with Limb in April, whilst you can catch them at The Lexington for the album release show on the 7th April, we'll see you there!